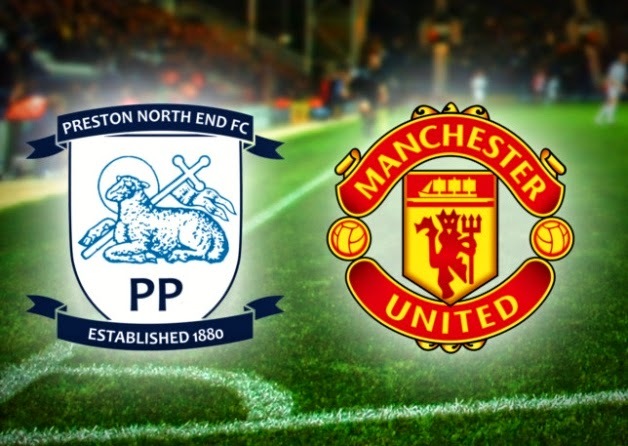 Manchester United returned to the competition that represents their most realistic chance of silverware this season with a visit to Deepdale to take on League one side Preston. The winners of this match would enjoy a home tie in the quarter-finals against Arsenal. After disposing of Yeovil and Cambridge this was another chance to progress in the competition that United last won eleven years ago. However, it could quite easily have been a potential banana skin for the Red Devils. After the struggles of the last few matches, the choice of Louis van Gaal’s starting XI was going to be interesting. Would he stick with the under performing Januzaj or recall Herrera, how would the defence line up after the ineffective performance of Evans. Lastly, the main talking point was who would he play up front seeing as though van Persie and Falcao were not exactly setting the world alight. The questions were answered when the team was announced: De Gea, Valencia, Smalling, Rojo, Shaw, Blind, Herrera, Rooney, Fellaini, Di Maria and Falcao. A strong line up with a first start for Ander Herrera since December but no place in the squad for Robin van Persie who was injured. The defence was strengthened with Shaw and Valencia recalled and Fellaini drafted into midfield. Rooney would at last start in the position the majority of fans want to see him in, striker alongside Falcao. 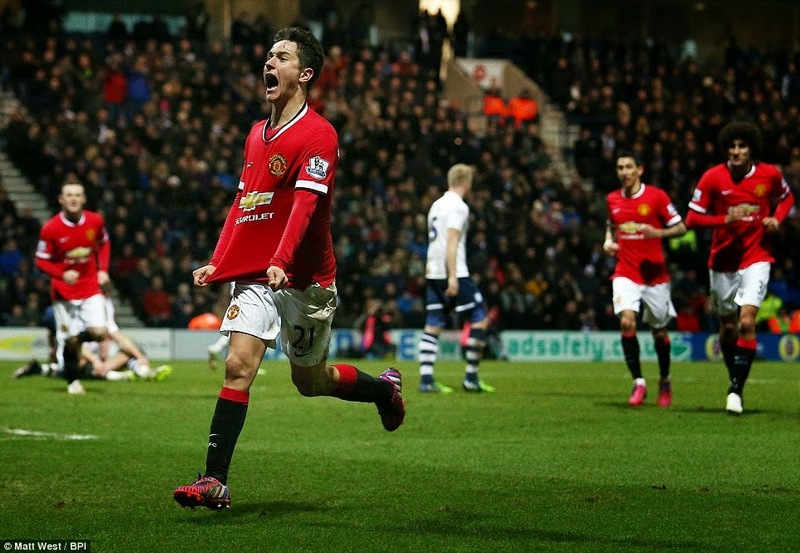 Subs: Evans, Mata, Januzaj, Young, Valdes, McNair and Wilson. The match kicked off in front of a full house of over 21,000 with the stadium bouncing as was to be expected. United started well and won a corner in the first few minutes, but Wayne Rooney’s delivery to the near post was headed clear, where is Phil Jones when you need him? Daley Blind was left red faced early on as he tripped over the ball from a pass in defence, maybe he was still feeling the effects of the knock on his head from the Burnley match. Kevin Davies was still up to his old tricks by conning the referee into awarding him a free kick after a clash with Blind, old habits die hard. Fellaini received an elbow to the nose and had to go off for treatment but strangely didn’t earn a free kick from the challenge. It would have been interesting if it had been the other way around. The good news is that Fellaini would have the last laugh. The first half was yet another poor showing from United even though they had around 70 percent of the possession they had nothing to show for it. It was a half that lacked penetration up front as Falcao performed poorly and looked out of it and off the pace for most of the time and the majority of the play from the visitors was at a pedestrian pace. The only threat was from the lively Di Maria who tried to feed the ball through to his captain Rooney at every available chance. All the corners and dead ball situations were of poor quality and wasted from United. 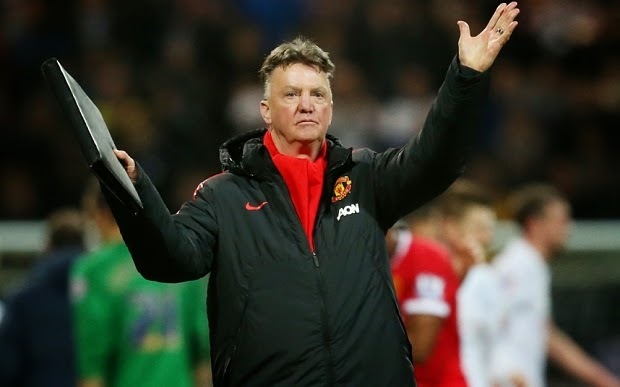 Basically, once again van Gaal had his job cut out in the dressing room to try and instill some urgency into his team. 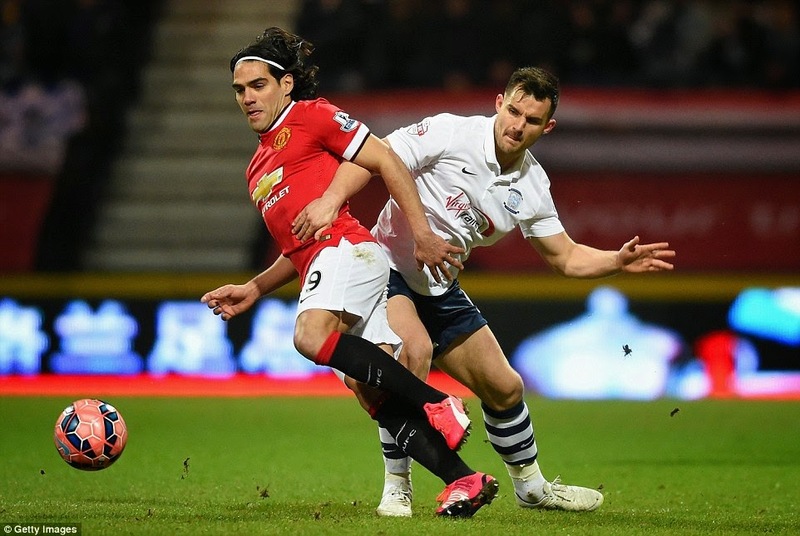 The second half started with United on the back foot as Preston pressed forward. Their efforts were rewarded after 3 minutes as Scott Laird, who from the edge of the box shot across goal, with his effort taking a slight deflection off Valencia, before flying under De Gea into the bottom corner. 1-0 Preston and most definitely game on. In the 52nd minute, Preston could have doubled their lead when Davies almost connected with a floated free-kick at the far post. Let off for United. Then on 59 minutes the change that would eventually put United into the sixth round as Ashley Young replaced the ineffective Colombian Falcao who really didn’t perform and on that showing I wouldn’t be surprised if he wasn’t chosen for the next few matches. His reaction to being replaced was strange as he appeared to be unable to see his number being displayed on the board. Maybe that’s the problem with his display, he needs to have his eyes tested. Garner almost headed the home side ahead after 61 minutes, but David de Gea was alert as usual and saved down low. It was then that United started to turn the screw once Falcao had left the pitch as Fellaini now playing alongside Rooney tried to bundle the ball home but was prevented from doing so by resolute Preston defending. Eventually, after good work from Di Maria, Blind and Young on the edge of the home side’s penalty area the ball came to Herrera who slotted his fourth goal for United into the bottom corner of the net. A perfect time to equalise and now the away support could be heard in full voice as the goal had quietened down the home fans who must have been expecting the worst. Since coming on Ashley Young had made such a difference to the team giving not only a good balance but also badly needed width. Marcos Rojo was booked for a foul close to the edge of the penalty area therefore being the only United player to be cautioned in the match. Kevin Davies was very lucky to escape a red card after bringing down Smalling. He should have gone in all honesty and Preston knew this and substituted him shortly afterwards. Then in the 72nd minute Fellaini became the hero yet again as he netted after his initial header was saved he powered home the rebound in from a tight angle. A well taken goal from the Belgian who has impressed this season with his gung-ho displays. To lead 2-1 United had shown true character under pressure to fight their way back into the tie and after the second goal looked comfortable with Fellaini partnering Rooney in attack. The Belgian is such a difficult player to play against as he is just so ungainly and brings something different to the attack that defenders can’t seem to handle. There was the usual panic defending from Smalling in the last ten minutes which almost allowed Preston a way back in but they wasted their opportunity. Other players were being sloppy with their passing including Valencia. The defence do have this habit of trying to play the ball around to each other which does cause palpitations in my chest area. 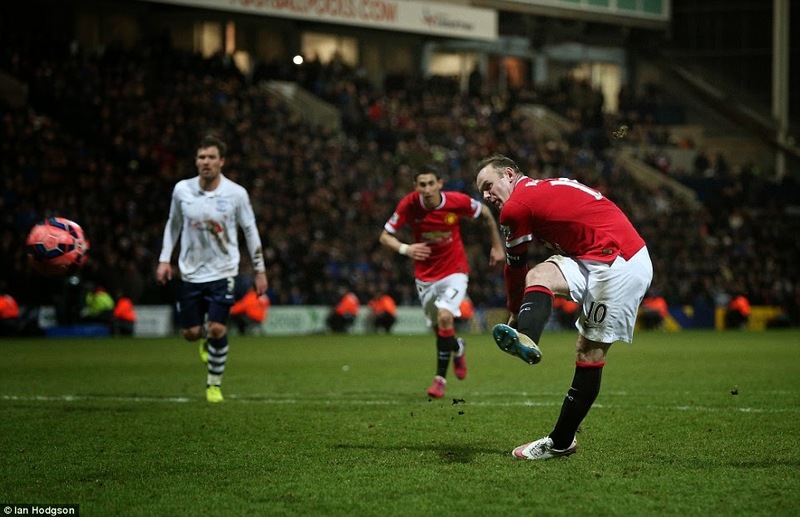 On 86 minutes, Rooney won and converted a penalty to make it game over and more than guaranteed their place against Arsenal in the next round. As he chased a ball in the area the keeper Stuckmann dived at his feet, Rooney went to ground after little or no contact. There were decisions in the match that the referee didn’t give United’s way so for me the penalty was justice. 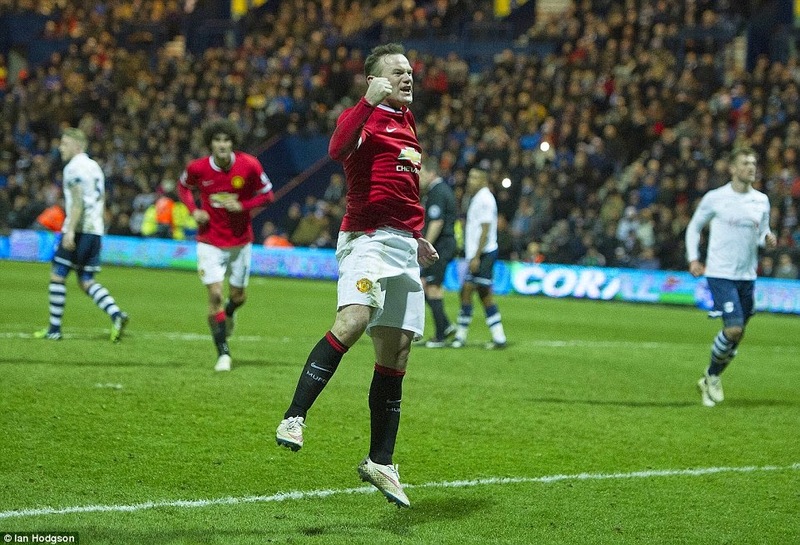 That was Rooney’s first goal this year and a very welcome one. Preston, to their credit, did try and make the scoreline respectable and if not for De Gea and Young, who cleared off the line, they could have reduced the deficit. Full-time and the match ended 3-1 to United. A win that they fully deserved after their spirited display in the second half. With outstanding displays from Di Maria, Herrera, Fellaini and Rooney who helped to pick the Red Devils up and through this tricky tie. Rooney really had shown his enthusiasm playing up front and definitely looked happier in that position as opposed to being stuck in midfield. For me, he was the man of the match closely followed by Di Maria. This was a game of two halves as the match didn’t really came to life until Preston had taken the lead then United woke up. Also, the substitution of Falcao forced van Gaal to change the team system pushing Fellaini up front alongside Rooney with Young in midfield. United are now seven games unbeaten and on another run with only one defeat in nineteen games but will van Gaal stick with the eleven that performed so well in the second half or tinker again for the next match. What a mouth watering quarter final we have to look forward to Man United versus Arsenal at Old Trafford with so many past confrontations in the cup down the years this is really a tie to get the pulses racing. With the momentum building in the United side, I fully expect them to overcome the Gunners and they now have a great chance to go all the way to Wembley. United’s next match is over the border into Wales for a difficult Premier League visit to Swansea City. Remember this was the team who beat United at Old Trafford in Louis van Gaal’s first official match in charge at the beginning of the season. I am expecting a difficult match but believe United will come back to England with the three points. This week also sees the Champions League resume. It will be surreal to watch without United being involved, so I probably won’t. Having said that the United players should watch the matches as a way of spurring themselves on for that all important top three finish. Forget top four there is no reason we can’t end the season in the first three and not have to sweat on the qualifying match the fourth team has to go through. We are on the way to Wembley, hopefully! Next United lose it at The Liberty.